If you’re looking for a multimeter with an attractive set of features, this might be the one. Extech is a well-known company, and they’re famous for designing durable and versatile multimeters. The best thing about them is that they offer instruments both for professionals and amateurs. It doesn’t matter if you’re dealing with electricity on a daily basis, or you’re just a DIY enthusiast, Extech offers more than enough choices. The other thing they’re famous for is – affordability. Whichever unit you choose will turn out to be the right decision, and it won’t damage your budget, even if it’s limited. 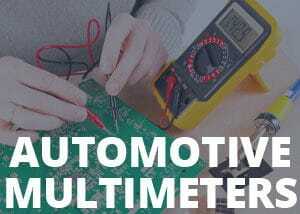 Purchasing a multimeter shouldn’t be a rushed decision. That’s why we’re here! We offer a deeper insight into the features and functions of various multimeters so that you can save some time and effort. Instead of conducting a thorough research and wandering around the Internet, you can find a list of full reviews with a lot of useful information here. This particular model has 12 functions including AC/DC and voltage, capacitance, resistance, temperature, frequency, and pulse ratio. It also has a pretty large and readable display, which is neat. Many people have a problem with small displays because most of the data is illegible, especially in darker environments. It’s very easy to use this multimeter, even if you’re not an expert. It’s compact, easy to read, and most importantly – versatile. Thanks to its versatility and the number of additional functions, you can troubleshoot and repair anything you want, even sensitive electronics such as computers, cameras, and so on. The NCV feature allows you to detect certain voltages without making contact with the thing you’re analyzing. In simpler words, all you have to do is hover over whatever you’re testing, and the device will detect the presence of current if there is any. This function is primarily a safety measure because it warns you about the “ghost” voltage. Although the current intensity probably isn’t fatal, coming in contact with ghost voltage can cause a short circuit and damage the sensitive electronics or even break it beyond repair. The data hold option is incredibly useful for people who can’t write down the readings immediately. In other words, the unit stores your last reading until you rewrite it with a new one. It might not seem like a big deal, but a lot of professionals appreciate this feature. It does not only facilitate the use of this product, but it also saves a lot of time and effort. People often forget to turn off their instruments after use because it doesn’t seem important. However, if you take a moment and calculate the number of times you’ve bought another set of batteries, you’ll see that it’s worth shutting down your tool after every use because you’ll certainly save a significant amount of money. Also, how many times did you get ready to start a project and found out that you forgot to buy new batteries and replace the old ones? Well, those days are over thanks to the auto power off option. The device will shut itself down after 15 minutes of inactivity. While it doesn’t seem as important as other features, the low battery indicator surely deserves to be mentioned. If you’re wondering why is it so important – the reason is quite simple. People often forget to buy or replace the batteries, especially when there isn’t anything to warn you about the low battery levels. However, you won’t have an issue with low battery thanks to this feature. Pay attention to the battery symbol on the multimeter’s screen, and you’ll never run out of power. Most high-end multimeters have this option; however, it’s pretty rare in this category, and that’s why we think it’s worth mentioning. The concept is pretty straightforward. To measure temperature, all you have to do is select the temperature mode. Without anything plugged into the multimeter, it will show the room temperature. However, if you have a special probe, you can measure the temperature of various items. Make sure that you don’t mix the polarities; it’s very important. This function is useful for people who don’t like setting the scale manually. Although it’s great for saving time and effort, it’s not as precise and fast as manual ranging. Therefore, some people don’t like the auto ranging feature due to the lack of precision, although it’s often not a massive difference in data. The compactness and lightweight are what separates this multimeter from the others. There is a common misconception if something isn’t heavy that it’s bad by default. However, this claim isn’t true at all, as we can see with the Extech EX330. You can put it in the toolbox or your pocket, and you won’t even notice it. Because of its versatility and ease of use, anyone can use this unit. It packs a lot of auxiliary features that are great for professionals who are dealing with electricity on a daily basis. It’s also great for DIY enthusiasts because even if it seems complicated and complex, you can get a hold of it within an hour, as long as you follow the rules and user manual. Electricians love the data hold and low battery indicator features, and a vast majority of them are pretty pleased with the Extech EX330. So, it doesn’t matter whether you’re a professional or not, you’ll certainly find a couple of useful functions and crucial features. Although it’s a good multimeter, it comes with a few mentionable disadvantages. First of all, the test leads have very short tips. It might not seem like a big deal, but more than a few people reported that it could be a burden sometimes, especially if you’re used to the leads with longer metal tips. However, it’s an easily solvable issue. All you have to do is purchase another set of leads with longer tips; they’re pretty cheap. Some people reported that the values on the display couldn’t be read from a certain angle. In simpler words, if you tilt the device to a specific angle, you won’t be able to see the results. Needless to say, the way you can avoid this is to simply not tilt the unit while you’re reading the data. One other thing happened more than a few times, but it’s not related to the quality of the product but rather the company. Namely, a lot of people didn’t get the test leads and the temperature probe even though the description clearly states they’re included. Sadly, the only thing you can do is return the product and wait for a new one. Not at all. It’s pretty straightforward and can be used by both beginners and professionals. Does this unit have a display backlight? Does it have the data hold function? Yes, it does. The data hold option allows you to store the last reading until you overwrite it. Are the test leads included? Yes, they are. The temperature probe and a set of batteries are included as well. Can it read a dual run capacitor HVAC or just DC CAPs? It depends on the size of the CAP. The Extech EX330 can measure CAPs up to 200uF. People who have purchased this product seem quite pleased with it. Of course, it has a few downsides, but it’s important that they don’t interfere with the precision and resolution of this unit. The most liked thing about this multimeter is its price. It’s affordable, and anyone can expand their toolkit without spending hundreds of dollars. The Amazon ratings are also pretty impressive. It has a 4.2-star rating which is pretty good because Amazon doesn’t tolerate poor quality products. As you can see, the 4.2-star rating is more than enough proof of good quality. Purchasing this product won’t be a mistake, that’s something we can guarantee. Whether you need all of the additional functions or not, is up to you to decide. However, no one said you have to use them all. Buying a product with a lot of features that you don’t need can be an issue sometimes, however, because this unit is affordable, you are not risking overpaying the Extech EX330. Options such as the low battery indicator or the ability to read the temperature of an object within seconds make this multimeter a tool worth checking out. If you think it’s not the suitable one for you, feel free to read our other reviews, you’ll certainly find something for yourself.